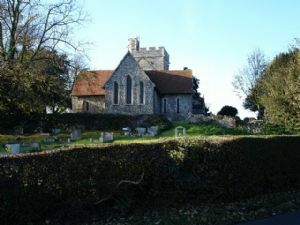 The ancient church of St Mary Magdalene stands on a hill about half a mile from the village of Stockbury. A church is recorded here in the Domesday Book and the massive Yew tree beside the church is over 900 years old. We are a small, friendly congregation seeking to serve our village community and its surrounding area. We welcome all visitors to join with us in our worship, which takes place in the evenings (during the warmer & lighter months of Spring & Summer) and in the mid-afternoon (during the Autumn & Winter). Our worship is at once traditional in style, yet also more quiet and reflective. We hope that those joining us will find the same peace here as those who have long loved this church. We are looking to see how we can develop the church as a more distinctive place of reflection and retreat within the benefice in the future. On all other Sundays, services follow the pattern below. The church is open during the day on Saturdays and Sundays. At other times, the key can be obtained from the Stockbury Village shop, MB Farms.